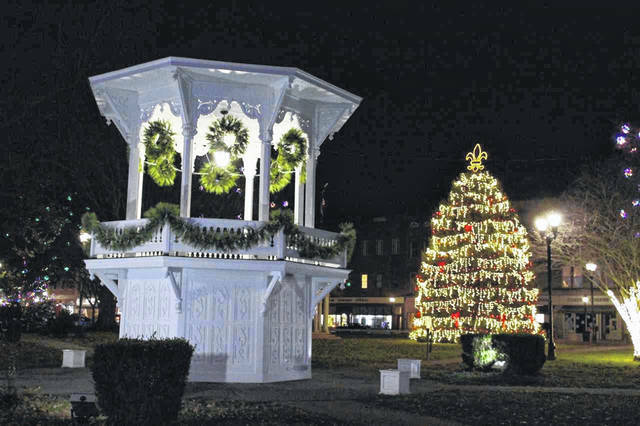 The newly refurbished bandstand, pictured, is the place to be Wednesday evening when the countdown to the 6th annual Gallipolis In Lights Park Lighting takes place. For the second year in a row, the Gallipolis In Lights Park Lighting will include fireworks sponsored by Holzer Health System. Seen here are fireworks from last year’s show shortly after the “lights” were illuminated in the park. GALLIPOLIS — The “on” switch will officially be flipped this Wednesday evening, Nov. 21, for the 2018 edition of Gallipolis In Lights. 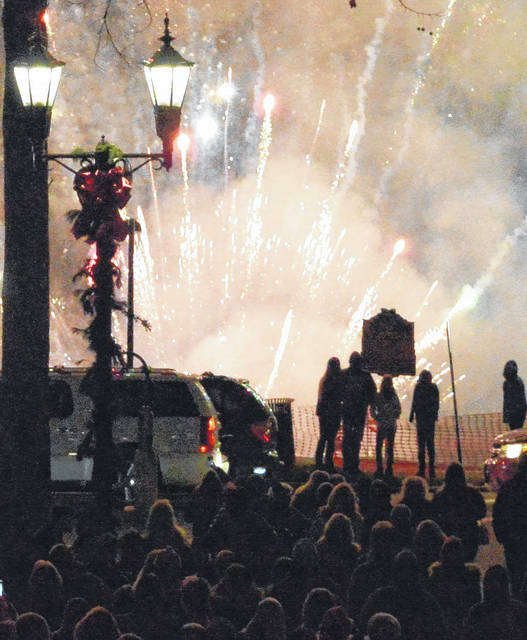 The sixth annual park lighting ceremony will once again include a fireworks display provided by Holzer Health System, live musical entertainment and of course, an appearance by Santa, all in Gallipolis City Park. It all begins at 5:30 p.m. when Santa arrives along First Avenue in a custom car that is part automobile, part sleigh. He’ll be joined at the park by Mickey Mouse, Minnie Mouse and Olaf from “Frozen” who will all visit with local children. Performances also begin at 5:30 p.m. with the Gallipolis Twirling Angels followed by live musical numbers by the Gallia Academy Madrigals group and some members of the Madrigals for special, additional performances, the C.A.T.S. children’s choir and local singer songwriter, Devin Henry, all performing Christmas songs from the stage located next to the historic bandstand. The bandstand, which is recently refurbished, will be adorned with new greenery and lights, making it ground zero for the actual lighting ceremony which begins at 7 p.m. From the bandstand, will be guest, and Speaker of the Ohio House Rep. Ryan Smith, making a few remarks with Miss and Teen Miss Gallipolis In Lights, Samantha Burris and Kenzie Long, respectively, helping to throw the switch. Last year, the throwing of the switch coincided with the fireworks display and was meant to be a surprise. Hired for the job are fireworks launching company Legendary Entertainment, which provides the pyrotechnics for Rockets Over Rio. The Gallipolis In Lights organization incorporates new additions to the park each year to grow the display, and this year is no exception, according to volunteer Shari Rocchi. Rocchi said the additions are a surprise but invited everyone out to the lighting ceremony and park this season to enjoy them. An obvious area of expansion in the display at the park will be the tree walk, growing from around 160 last year to 216 this year. The trees are sponsored by individuals, families, churches, schools, etc., which personally decorate the trees, making them each stand out with their individual stories along the park paths. As for the light balls which hang from the trees, that number has grown to around 1,800 this year, give and take replacing some of the old ones. Over the weekend, Rocchi said there were reports of vandalism at the park involving some of the light balls and extension cords being pulled from a few trees. A portion of the light balls and extension cords are hung with the use of ladders, even bucket trucks and are specifically placed in their areas for maximum effect. Rocchi said it’s often not an “easy fix” and it can get “costly” to go back and redo areas which have been tampered with, though she added Gallipolis In Lights is discussing how to add more security to protect the display and has the assistance of local law enforcement which is “patrolling the park frequently,” she said. Despite those reports over the weekend of tampering with some trees, visitors to Wednesday’s ceremony will find Gallipolis In Lights ready to illuminate the night sky, as the crowd chants the countdown to throw the switch. Tractor and wagon rides around the park will be offered 6-9 p.m. during the lighting ceremony by Evans Wealth Management. Also hot chocolate and cookies will be available during Wednesday’s festivities. Volunteers have been working countless hours for weeks putting up the display and that doesn’t count the hours of creating the light balls. The display is free to all and has become not only a holiday tradition but tourism draw to downtown Gallipolis.